Why aren’t those calves with their mother? An article in Saturday’s Palm Beach Post about Larson Dairy, one of Florida’s largest dairy farms, included this photo of dozens of young calves, confined individually in small wire hutches covered with a piece of fabric for shade. Why aren’t these calves with their mother? Because humans are drinking her milk! On large dairy farms, calves are taken from their mother shortly after birth and fed artificially. 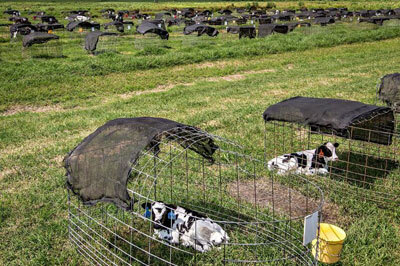 (Female calves are raised as “replacements” for adult cows who are sent to slaughter when their production declines.) The calves spend the first weeks of their lives cut off almost completely from contact with other cows. Not all calves survive the stressful, unnatural, forced separation from their mother. When ARFF visited a Florida dairy farm we found one poor calf dead and covered in flies inside a wire hutch. A video of the disturbing scene can be found on ARFF’s YouTube page. Visit ARFF’s website to learn more about the dairy industry. (Tallahassee, FL) — Animal advocates are hopeful that Florida Governor Rick Scott will once again reject state funding to promote alligator products. The Animal Rights Foundation of Florida (ARFF) has sent a letter to Gov. Scott urging him to veto $250,000 that has been included in the 2013-2014 budget for “alligator marketing.” Budget items 1435 ($100,000) and 1756 ($150,000) are intended to promote alligator meat, leather and by-products. In 2011, Gov. Scott vetoed $150,000 that was budgeted for alligator marketing. On alligator farms in Florida, thousands of these magnificent animals are killed each year. Farmed alligators often live in dirty, crowded, unnatural conditions in concrete or metal tanks. Disease is commonplace, and slaughter is inhumane. A copy of ARFF’s letter is available upon request. Yesterday, an Animal Control Officer in Port St. Lucie rescued a raccoon who had been caught in an illegal leghold trap. The poor animal’s front paw had to be amputated (a report by Fox 29 News features a photo of the raccoon’s horrific injuries). In 1972, Florida banned the use of steel-jaw leghold traps, but they are still widely used by trappers in other states to catch raccoons, coyotes, bobcats and other fur-bearing animals. When an animal steps on a leghold trap, the trap’s jaws slam closed on the animal’s limb. The animals efforts to escape often lead to serious injuries. If you ever hear someone defend trapping as humane, or if you’ve ever considered purchasing a coat with fur trim, please remember the sad photo of this raccoon.